Hey there. Every year, many of us make resolutions for the New Year. "I'll eat better, I'll cut off eating fatty foods, I'll exercise more." Those are just some of my resolutions that I've had in years past and I'm proud to say that I've stuck with them... mostly. =oP Anyways, this year, I told myself that I need to take an even closer look at my overall health. I like to think I'm relatively healthy, I exercise and I eat well, but I know I could make better health choices. One of those changes that I'm looking to make involves coffee. For those of you that know me, I LOVE coffee. But you know what... I drink too much of it. That afternoon cup is not necessary. Plus, coffee stains my teeth. What about energy drinks or shots? Forget it. I don't want to have energy shots or drinks. They have just as much caffeine as coffee and may come with adverse side effects. No thanks. I need something that is quick, easy, and effective without any negative side effects. Enter AeroLife Energy. Never heard of it? I'm going to let you in on a little secret... I haven't either. That is, until I received a product sample! 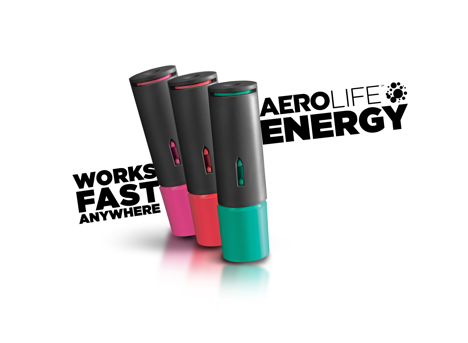 Now trust me when I say this, I will never forget the AeroLife Energy system now that I have tried it. Let me tell you why. But first, what is AeroLife Energy? AeroLife Energy is a unique blend of energy, vitamins, and flavor in powder form. The powder is placed inside a small, portable container called an AeroPod and you pull the cap back and draw in as much powder as you need and swallow for a quick boost. It has 0 calories, 0 sugars, and it is just smart nutrition. Need a visual? Check out this video. Feel a little more informed? Me too. lol When I received the AeroLife Energy samples, I was quite glad that I also received a guide book/brochure. The book has all sorts of information on the system and how it works. It provides you with insight on the design and the contents within. Having never heard about AeroLife Energy before, having as much information about the system was a huge plus in my book. 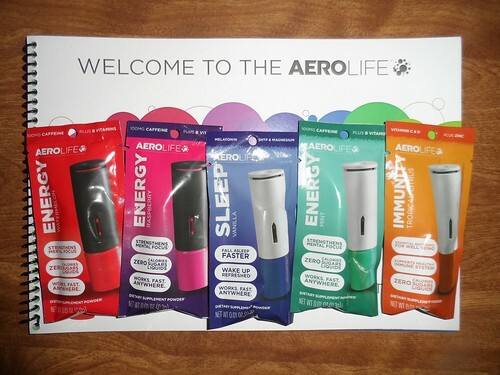 The samples received were the AeroLife Travel AeroPod, 3 Energy Flavored AeroPod, Sleep AeroPod, Immunity AeroPod, and Sport AeroPod. The travel AeroPod (combination of sleep, energy, and immunity boosts) is perfect for those of us that travel. 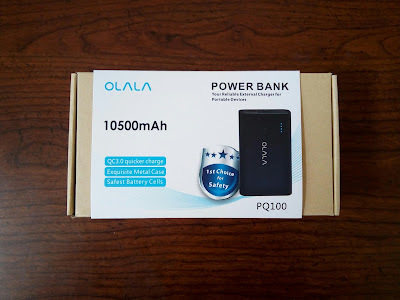 It boosts your immunity to fight off sickness, it gives you a boost of immediate energy, all while helping your body rest well when it's time to sleep. The Energy AeroPod is just that, a boost of energy. I love that I had 3 different flavors to choose from (Mint, Raspberry, and Watermelon). A little change is always good. The Sport AeroPod is one that I see myself using more and more. Since I do go and workout and push my body, the Sport boost provides that boost of energy that I am looking for and provides my body with a dose of electrolytes. Perfect for a guy like me! The last one that I tried was the Sleep AeroPod. If you suffer from sleeplessness or you simply want to get a full night's rest, the Sleep boost is for you! So well did they do during my trial run? Let's find out! First, the AeroPods are pretty cool. The system is all air based so you will have to draw in your shots. You simply pull out the cap of the AeroPod, place the opening in your mouth, and draw in some powder. You are in complete control as to how much you draw in. Each AeroPod claims to hold 3 to 5 boosts, but I found that they carry more than that. The last thing that really caught my attention is that the AeroPods are refillable so you don't have to have a new AeroPod each time you need more. When I gave AeroLife Energy a try, I was surprised by how quickly it too effect. About a minute or so after taking it, I felt a slight surge of energy coming on. So far so good. I placed the AeroPod in my pocket and went about my day. I felt pretty good and alert throughout the day. Not too alert where someone would say I was hyper but just enough where my mental focus was heightened. But the absolute best part was that I DID NOT suffer a crash afterwards. Those energy drinks and energy shots on the market avoid telling you about that crash but I am glad that AeroLife Energy had no such crash coming my way! The next day, I decided to give the AeroLife Immunity a try. I wasn't feeling sick, but I did notice that some people at the office were a bit under the weather. I didn't want to take any chances and wanted to give my immune system a boost. I had a boost before work, during work, and right after that big meeting. I can't say with absolute certainty that it worked, since I did pick up the sniffles, but at least I didn't get that stomach bug that took out a few of my coworkers! The following day, it was leg day! I had to be pumped for my workout. I decided to take the AeroLife Sport and put it to the test. I felt a slight rush of energy and I did notice that I didn't feel as fatigued during my workouts. I would like to contribute that to me being stronger, but I'm sure that it was the boost that I took that made that difference. Especially when I know that I'm whining like a baby to my wife after having to endure leg day at the gym. lol If AeroLife Sport is to credit, I'm definitely picking up more of this! Now, I still have the AeroLife Travel and AeroLife Sleep to try. I haven't traveled anywhere just yet and to be honest with you, I'm a night owl so I don't think I'll be using the AeroLife Sleep AeroPod anytime soon. But if there is anything that I can take away from using these boosts, it's that they definitely do what they are set out for. And if that is the case, I do not doubt at all that AeroLife Sleep and Travel will do their job as well. So there you have it. My experience with the AeroLife Energy system. Is this something that interests you? Something that you would like to try out? Then do it! Start your free trial now! You have to experience it for yourself to see if it'll work for you. I gave it a go and AeroLife has found a customer for life. Take that next step and take the AeroLife challenge for a healthier you. Visit AeroLife.com for all the details! Later! I would give this to my son who is a online gamer. He would love it. I would give this to my boyfriend! He's been dying for one! Yes, I got an invite too, I was wondering what happens after you submit the form? I haven't gotten a notification or anything yet after submitting the form. It has been a week. Hey there Dee. I had to sit and wait for the welcome Email. I know that the program is still in beta testing so it could be that they just haven't gotten to you yet. Try sending them an Email. It's possible that maybe that they didn't get your application form. This looks like a really good headset. I would definitely use it for music and also for playing games! Just git the email today! Guess they waited until after my birthday xD. I got the email right before my birthday. Thrash, slash & dash on the XBox 360, and improve my move & groove to my fav tunes! I could always use a new set of turtle beaches! Great for my son, and hubby if he does the honey do's first. id give to my nephew for his birthday. hed use it playing xbox! I wold be giving this to my 14 year old to use if i won. He is a huge gamer!